Mixing the hope of God's light and biblical text, these bright confirmation cards are an inspiring reminder of God's goodness. These contemporary, stylish A6 cards are designed to be given by the church to confirmation candidates as a memento on their special day. Available as a pack of 10 cards with envelopes. 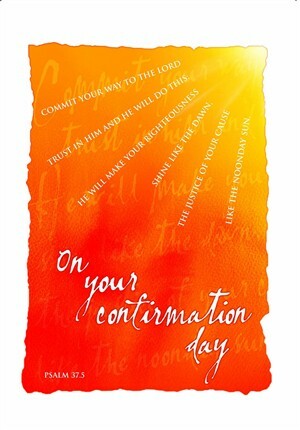 Sun Confirmation Card - Pack of 10 was published by Church House in October 2006 and is our 897th best seller. The ISBN for Sun Confirmation Card - Pack of 10 is 9780715121184. Be the first to review Sun Confirmation Card - Pack of 10! Got a question? No problem! Just click here to ask us about Sun Confirmation Card - Pack of 10.